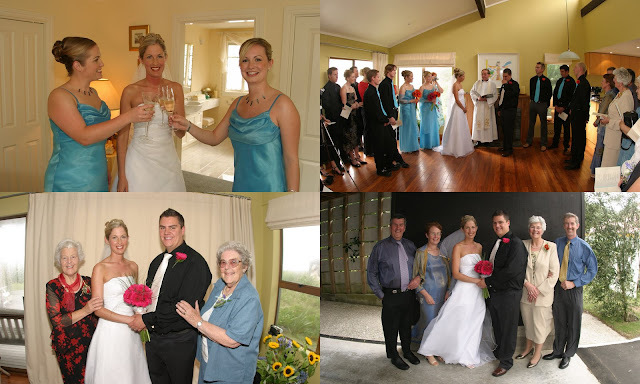 It only seems like yesterday we were exchanging vows in front of 50 family and friends who had packed into the lounge of our friend's beach house whilst 140 km/hr gales blew ferociously outside, lifting roofs and shattering windows in the vicinity. 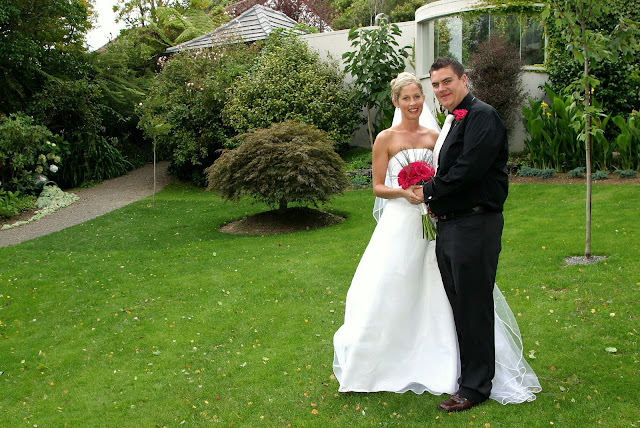 It was meant to be a summer beach wedding on the lawn of the beach house, with our photos down on the beach before retiring to a marquee on the lawn to partake in celebrations and cuisine. The weather, however, had other plans! Who can forget the storms of February 2004? Not many! The weekend before the wedding Mark and I flew to Christchurch to meet James (Mark's brother), Jon, Mark, and Ross (his best mates), and Mary-Ann (Mark's fiance and my bridesmaid). We enjoyed catching up with them, but in Christchurch the weather was already threatening, with our trip up the cable car nearly leaving us stranded at the top as the winds picked up significantly throughout the afternoon. I had a late night flight home to Wellington booked for Sunday night, as I had a university exam to sit on the Monday morning (nothing like a busy lead up to the wedding!). I was lucky to get out of Christchurch as flights were already being delayed and cancelled, and it was a rather hairy landing back into Wellington. I made it to the exam, but plenty of other students didn't as the flooding on the Hutt motorway prevented many from being able to make the journey in that morning. 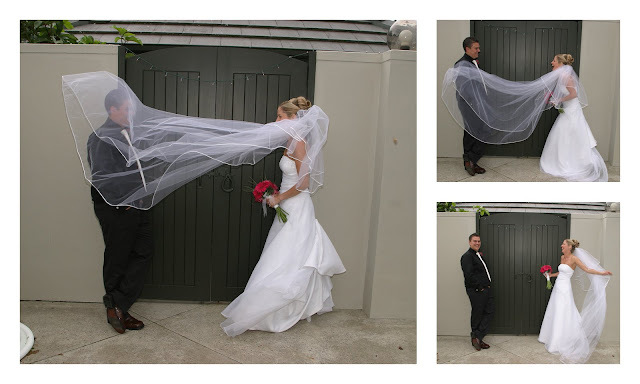 The next few days saw all our family and friends gradually arrive in Wellington, but again the weather turned very nasty on the Thursday and our bridal party nearly didn't make it up from Queenstown. They all described the journey from Queenstown to Christchurch as incredibly frightening with people screaming as the plane was buffeted about by the bad weather. The roof on our 100-year old house decided that enough was enough and it proceeded to develop several leaks that night. As a result we had to invest in a completely new roof just a few weeks later, making do with ice cream containers to catch the drips in the meantime. Friday morning dawned bright and clear, but the remnants of the bad weather continued to impact on our preparations. A large slip had come down in Paekakariki overnight, blocking most of State Highway 1 - the only road up to the beach house on the Coast. What was usually a 45-minute journey became an arduous 3-hour effort. This meant the marquee was rather delayed in arriving. Thankfully, my gorgeous bridesmaids Shannon and Mary-Ann had the foresight to book the fairly stressed-out bride a half-day spa experience for us all, so there was nothing for me to do but to forget about all the dramas of the week and relax for a few short hours. It is a good thing I wasn't on site at the beach house as more drama unfolded with one of the marquee tent pegs hitting the water main and causing great angst that we might not get it fixed in time to have running water on the day. Mum & Dad (UK) jumped to the rescue organising an emergency plumber, and only told me the story once it was all under control again. The forecast for Saturday was for 'gales like you've never seen it', but you wouldn't have known it when I woke up in Wellington at 7am in anticipation of the hair/makeup girl to arrive, it was just another blue sky day. However, by the time we got on the road to the Coast at midday, the weather had closed in with low cloud and a decidedly wicked wind. 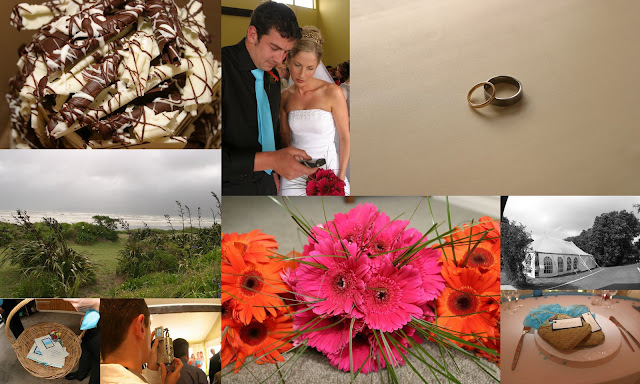 I'll never know how we had the presence of mind to make the incredibly wise decision on the Wednesday to move our wedding night accommodation to stay at Greenmantle (a luxury estate just a few kilometres away from the beach house). 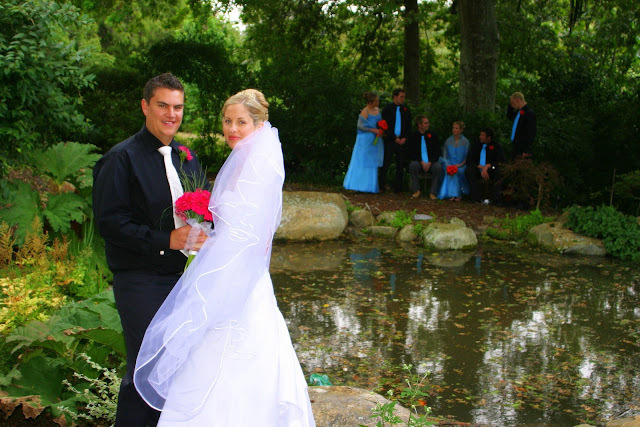 With a beautiful lodge nestled amongst a gorgeous private garden, it was the perfect, secluded and more importantly (sheltered) site for our photos and our wedding night. We stayed the night in the Cottage Suite and it was also a gorgeous room to get ready for the wedding in. The ceremony itself passed beautifully and uneventfully, although when you listen to the DVD we had made of the day, you can hear the marquee hire people banging tent pegs into the ground after the marquee ripped and nearly blew away several times during the day. The last calamity of the day was when the lighting caught fire in the marquee as a result of the tremendous wind blowing everything around. For a while there it looked like we'd be eating dinner in the dark so my brothers went out on an emergency mission for some tea light candles but mercifully the marquee people arrived back just in time to put up some emergency lighting before it got completely dark. They certainly earnt their money's worth that day. 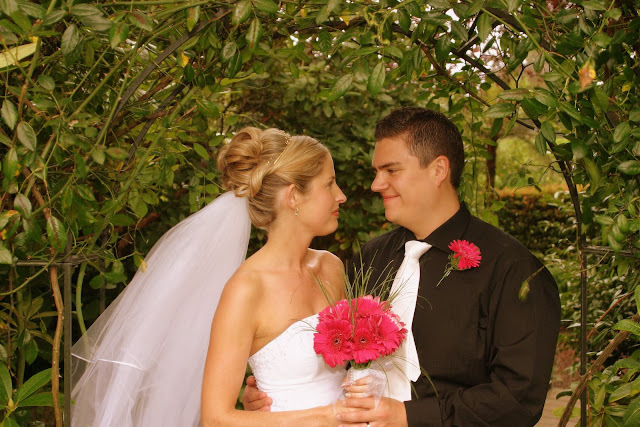 Five years on, it hardly seems possible that we had such a crazy, but oh so memorable wedding day. Even today our guests, who travelled from far and wide (NZ, England and South Africa) to be with us, still talk about the wild, wild weather. 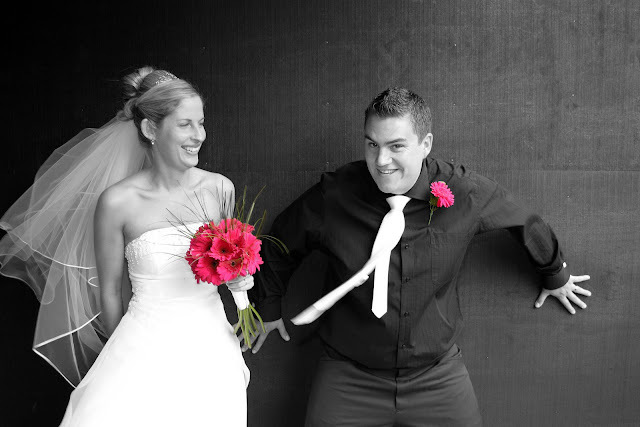 The fact that we managed to overcome the many obstacles thrown in our path in the lead up to the wedding and on the day itself made it all the more remarkable that we were able to stand together in front of our friends and family, vowing to love and cherish one another for the rest of our lives. This has been a slightly less frenetic week, much needed after the busyness of last weekend. That being said, we still enjoyed an adult's meal out on Wednesday night at our favourite stomping ground from 2 years ago, The Tasting Room on Courtenay Place. We all had lovely hearty meals, and learnt our lesson, only sharing one Spicy Cheese Fondue starter between all of us before our huge mains arrived! This week has also showed great progress on our landscaping which is now all completed bar the grass growing. It is surprising how large the area now looks with the retaining wall completed to flatten out the area and all the old garden removed! It is also nice to know the section is now fully fenced and child-proofed for future years! What a great job our lovely friend Andrew has done for us.....cheers mate! Friday night we had Shannon and Guy over for an indoors BBQ, the weather having turned awfully nasty on Thursday, with heavy rain and flooding across much of the North Island. Poppa is happy up in Hamilton though as it means their water tank is full again after a decided lack of rain in recent weeks. It was great for Mum & Dad (UK) to catch up with Shannon & Guy, and we then had Becky, Jonny & baby Brooke over for a very Kiwi brunch - pancakes, bacon and banana drenched in maple syrup on Saturday morning. After Noah's lunchtime nap, we headed into Moore Wilsons to show Grandma & Grandad the cool household wares, toys and gourmet food departments. And surprise, surprise we ran into Noah's daycare friend George in the toy section, so after we had finished our shopping, we met them up at the park for the two boys to enjoy a great runaround and letting off of steam. Saturday night, us adults sat down and enjoyed watching Slumdog Millionaire. None of us knew had any idea what to expect from it, but we were all extremely blown away by by it, and I for one, think it thoroughly deserves all the award wins and nominations it has had so far this year. It will be interesting to see if it takes out the Best Picture at the Academy Awards next weekend, after already taking out the Best Picture at the BAFTAs and Golden Globes so far. Today (Sunday), Mark went out for a very long ride (doing the whole Karapoti course -50kms of hard slog on a mountain bike), I went to church, leaving Grandma, Grandad & Noah to their baking in the kitchen. By all accounts, the kitchen was an absolute wreck but the pussycast and aeroplane shortbread that resulted was well worth all the mess! We had a hilarious few minutes yesterday afternoon when Daddy & Noah decided to get into the groove and do some dancing to Moby. I've uploaded two videos of the fun they had...there's definitely some rhythm there! This week we're hoping to have another meal out together on Friday night before heading out to Raumati for 5 days to stay at the beach house. It will be made all the more special by the fact that we this is the very same beach house where we got married 5 years ago, and is quite a treat to be able to stay there on the night of our 5 year wedding anniversary with our lovely family! We're then back in Wellington for one night (Wed 25th) before all 5 of us fly up to Hamilton to spend a long weekend with Nana & Poppa. As we won't have Internet access at the beach, we'll look forward to updating you all in two week's time! Last week's lack of a blog was due to our excitement at seeing Grandma & Grandad arrive safe and sound and wanting to catch up with them as much as possible that first night. 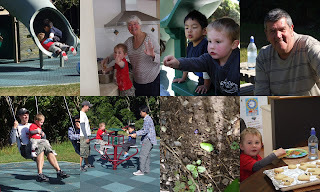 It was a fairly quiet weekend, lots of cleaning for me Saturday with Noah in tow, whilst Mark attacked the Akatarawa's in the annual 4-hr orienteering mountain bike race him and his friends have done the past 3 years. Saturday was the hottest day of the summer so far and I think they all found the ride pretty sweaty work but a fun day out all the same. Noah and I had fun at the zoo with Jackie and her family on Saturday afternoon but it was hot work pushing Noah around in the stroller, he would have been fine to walk except I forgot his sunhat and the stroller provided a little extra shade! Sunday we could barely contain ourselves with excitement waiting for 2pm to roll around. And we didn't even have to wait too long at the airport before we caught a glimpse of the beaming faces of Grandma & Grandad as they came through the doors. They have had a lovely week by all accounts exploring central Wellington and even managing a ferry excursion over to Days Bay on the best weather day of the week. Then Friday it was off to New Plymouth bright and early for a weekend with GeeGee. As it was the annual Sevens competition in Wellington, the roads out of town were dead quiet with all the traffic headed in the other direction. 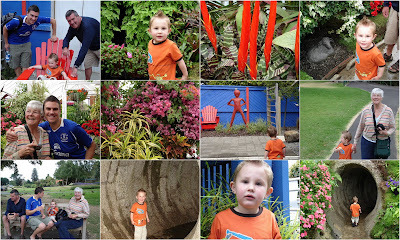 We had our usual stop at Virginia Lake in Wanganui, and whiled away a lovely hour there. We had taken some bread to feed the ducks who were extremely overeager in their desire to get some bread, one even having the cheek to grab the bread right out of the bag in my hand, at which point Noah decided it wasn't actually fun anymore - with which I heartily agreed. So we had to chase off the hundred or so ducks who were following me around like the Pied Piper and then it was onto coffees and fluffy and a look around. It was a year since we had been through the winter gardens at the lake (usually we are far too preoccupied with the birds, ducks and playground) but Noah discovered a tunnel which he had great fun running through with Grandad. After a brief, obligatory look around the bird aviary we were back on our way. It was scorching hot when we arrived in New Plymouth so much so that we decided a trip to the beach was on the cards. The tide was about perfect and Mark and Grandad wasted no time getting into the water. Noah on the other hand didn't want a bar of going in the water, no amount of cajoling or forcing seemed to make any difference, and in the end he seemed happiest just playing in the sand. Given this was only Noah's second ever time at the beach, and knowing how long it can take him to acclimatise to certain new experiences, we figure it'll come in its own 'Noah' time. We had a bit of a rough night on Friday night, all 3 of us (me, Mark and Noah) sleeping in one room. Noah woke at midnight with a nightmare (something about lions) and it took us 2.5 hours to get him back to sleep as it was unbearably hot in the room for us all. We were all feeling somewhat jaded on Saturday as a result. It is incredible to think that Mum & Dad (UK) have come from the coldest weather in twenty years to this heat. Their neighbours have even kindly sent pictures of The Old Barn covered in snow which is hard to believe when we're melting over here. It has been amazing to hear of all the disruptions the UK has suffered this week as a result of the snowstorms, and yet in this part of the world we are so sad to hear the news that 50 people have died as a result of the bush fires in Australia. Saturday was spent catching up with family, Noah's great great Uncle Bill & Aunty Shirley popping around for morning tea. Then we headed out for what has to be one of the best cafe meals we've all had in a long time at Fresha Cafe. The food was simply gorgeous (my Thai chicken curry filo tart just one example!) and very reasonable too. Then home to catch up with Wendy, and my cousins Bryn and Gwyl - who we realised we hadn't seen for two years since he ventured off to the UK. The beach beckoned again, although when we got down there it was incredibly windy - a better day for the kite surfers than for us sand bunnies. Noah was happy as anything playing in the sand, and ventured down to the water's edge with Daddy & Grandad, but still not in it...oh well...this time we didn't even mention going in as clearly he will do it in his own time when he is ready! Saturday evening, my other grandma (Nan) came over for a meal and we had a wonderful evening reminiscing about times gone by. It was particularly interesting for Mike and Sally (Grandma & Grandad) to hear about her life in the war, and the stories of my grandfather (Pa) who fought in Northern Egypt and Monte Casino and was awarded the Military Cross as a result of his bravery on the front line. We put Noah in my bed for the night while I slept out in the lounge and apart from being up at 5.50am, we all had a better night's sleep. This morning we headed off about 10am, it is always sad to say goodbye to GeeGee but now that we have free petrol (and we made it there and back on 3/4 of a tank!) and a lovely car to drive there should be no excuse not to get up there a little more often than we managed to last year, restricted as we were with my study timetable. On the way home, the mountain put on a stunning show for us, and we stopped in at the farm at Ngaere to catch up with Derek briefly. Wendy and Derek are hoping to pop in and stay a couple of days with Sally & Mike in April during their trip to the UK, so it was nice for them to see each other this weekend and make some tentative plans. Stunning views of the mountain, and a rare chance to take a special family shot! The rest of the trip passed uneventfully, and we were finally home about 5pm tonight. This week will be an interesting one for me, as my dear friend Jackie has now finished at M-co and I'm on my own for the next two weeks before having a week off with the family and the following week my new student starts...it's bound to be busy but hopefully manageable. We are hoping to have a meal out together on Wednesday night, I have an M-co reunion night to go to on Thursday and then we'll hope to have a quieter weekend around Wellington this coming weekend. Noah shows off his new Bob the Builder bag for daycare, Paradise Fish n Chips (and they were! 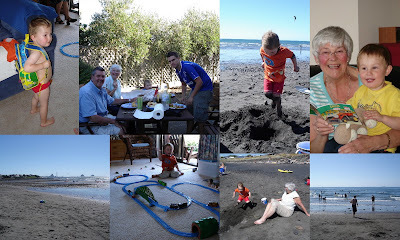 ), Fun at the beach, reading with Grandma, East End Beach, Daddy's best train track invention yet, and more beach fun! Noah is loving having Grandma & Grandad here, he really is in his element. We have already had some 'smashing' (to coin a Grandad-ism) times together in the past week and we are thoroughly enjoying all being together. I'm trying very hard to remember some of the funny things that Noah has said and done as there have been plenty, but sadly my brain is a little too weary and nothing is forthcoming tonight! 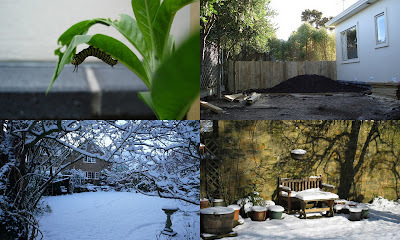 Two things I forgot to mention.....our monarch caterpillars are growing and growing and there's one very big fat one who can't be far from turning into a chrysalis. 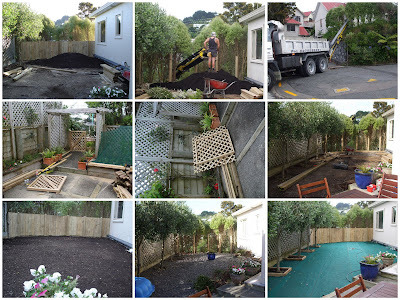 Also Andrew started on our landscaping this week, and it is coming together brilliantly...so watch this space!